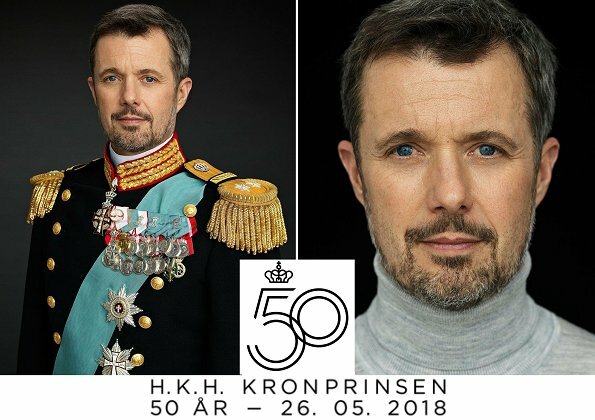 Crown Prince Frederik will celebrate his 50th birthday on May 26, 2018. On the occasion of that birthday, a series of events and celebrations will be held. On May 18, Crown Prince Frederik and Crown Princess Mary will give a dinner at Frederik VIII´s Palace for the board and shareholders of the Crown Prince Frederik Fund. On May 23, Crown Prince Frederik and Crown Princess Mary of Denmark will visit Aarhus and a series of visits will be made to various companies and organizations. The Crown Prince Couple will attend opening of International Sailing Center at the new harbour. Then, the Couple will open a new research center called “Crown Prince Frederik Center for Public Leadership” at Business and Social Sciences School of Aarhus University (Aarhus BSS). On May 26, after the changing of the guards ceremony, the queen and Crown Prince Frederik, Crown Princess Mary and their children will greet the crowds from the balcony of Christian VII's Palace at Amalienborg to celebrate the birthday. In the evening, a gala dinner will be given at Christiansborg Palace on the occasion of 50th birthday of the Crown Prince. In addition to the Danish royal family, royal family members of other countries, guests from home and abroad will attend the gala dinner. The celebrations will end with "Hele Danmark fejrer Kronprinsen" show which will be held at Royal Arena in Copenhagen on May 27. Happy 50th Birthday to Prince Frederik of Denmark ! Scandinavian royals really enjoy big birthday parties with tiaras so should be good viewing for us! A very happy 50th Birthday May 26th.Wow he really looks great for his age. Sport and Children keeps one young?. Actually, I think that Fredrik looks older than his years here. And he looks tired. But I also think that he ages well, he seems to become better with age. Anyway, good photographs, with a bit of character and depth, capturing him well. My Mother always used to say young children keep one youthful and fit. Excelentes fotografias. espero mas fotos con sus esposa e hijos. Con motivo del 50 cumpleaños se lanzó la esperada biografía del Heredero, escrita por el periodista Jens Andersen, a quien se le dio acceso cercano a Federico y su entorno durante un año. Such a handsome man! And he has this boyish charme and will always have - I hope!